Program of our "Panorama sightseeing tour to Munich"
Meeting points for our city sightseeing tours of Munich can be any hotel or restaurant in Munich or any other location of your choice within Munich. After having picked you up, your Munich tour guide will show you the most interesting sights and monuments of Munich. First, we will drive through the old town district and see attractions like the Old and New Art Gallery (Alte Pinakothek and Neue Pinakothek), the National Theatre and the Royal Residence, the Marienplatz Square with the Old and New town Hall and the "Mariensäule" Column, the church of Saint Peter and the famous Viktualienmarkt Square with its fine food stands. Afterwards, we will continue to Nymphenburg castle (summer residence of the kings of Bavaria) and have a walk through its gardens. Finally, having arrived at the Olympiapark, we will ascend to the panoramic platform of the Olympia Tower and enjoy a splendid panoramic view over the city of Munich. 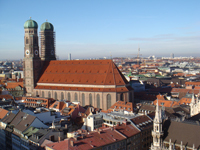 Comments concerning the "Munich panorama tour"